McNally Robinson provides learning for all ages inside the Community Classroom, located within the walls of our Winnipeg (Grant Park) store. A small and intimate space, complete with cherry-panelled walls, comfortable chairs, a large-screen projection system, and good-sized workspaces, the Community Classroom provides a soothing and aesthetic environment in which to learn and be creative. We have engaged some of Winnipeg's finest educators and experts to put together a wide array of class offerings for people of all ages, encompassing a varied list of interests. Class sizes range from 5 people to 32, depending on the workspace required for a specific course. Please note limited registration spots are available for each class. You are encouraged to register early to ensure a spot. Many of our classes sell out well before their start date. Visit this page to see a complete list of our available classes. Click "Book" next to your class of choice and follow the steps to complete the registration. Credit card payment required. Call 204-475-0483 and register by phone. Please have the course details ready to facilitate registration in the correct course. Credit card payment required. Drop into the store anytime and register in-person at our customer service area. Cash, debit, or credit card payment accepted. Attention: Community Classroom. McNally Robinson Booksellers. 1120 Grant Avenue, Winnipeg, Manitoba. R3M 2A6. Kindly note that the Reader Reward Card is not applicable on classroom registrations. If you've registered yourself via our website, you will receive an email confirming the booking. Likewise, if we register you in-person or over the phone with the aid of a bookseller, you will receive an email confirmation when the booking is made by our bookseller. Course registration is limited. If the course you registered for is full, your name will be placed on a wait list in order of registrations received. If a spot becomes available, you will receive a call from us. At that time, you can decide to take or decline the spot. Payment of your registration will be required at that time. If you need to bring supplies to your first class, you will be notified by email or telephone, prior to the first class. If you paid a lab fee for your class, your supplies will be available from the instructor during the first class. In some classes, educators enhance a program by providing background notes via email. Should a participant not have access to email, a small lab fee may be assessed to photocopy this material. 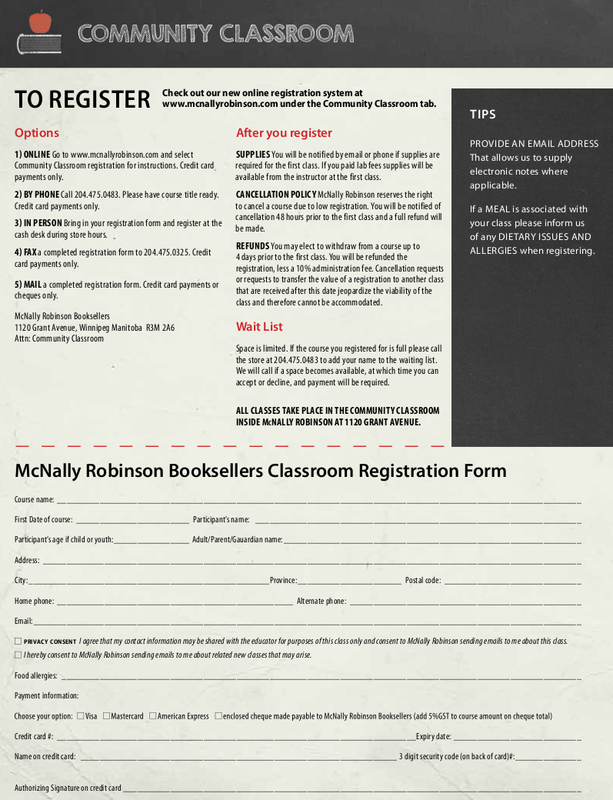 If there are insufficient registrations to warrant holding a course, McNally Robinson Booksellers reserves the right to cancel the course. Attempts will be made to provide you with 48 hours notice of cancellation, when possible. A full refund of your course registration fee will be made. You may elect to withdraw from course registration up to 4 days (or 96 hours) before the first class. You will be refunded the registration, less a 10% administration fee. Cancellation requests or requests to transfer the value of a registration to another class that are received after this date jeopardize the viability of the course and therefore cannot be accommodated. We will reply to your message as soon as possible, though our response may take a day or two. If you have an urgent matter related to the classroom (for example, cancellation of registration), please contact our Grant Park bookstore by phone: 204-475-0483.